Ano Meria is probably the only village in Cyclades which preserves the traditional farming lifestyle kept throughout the centuries. 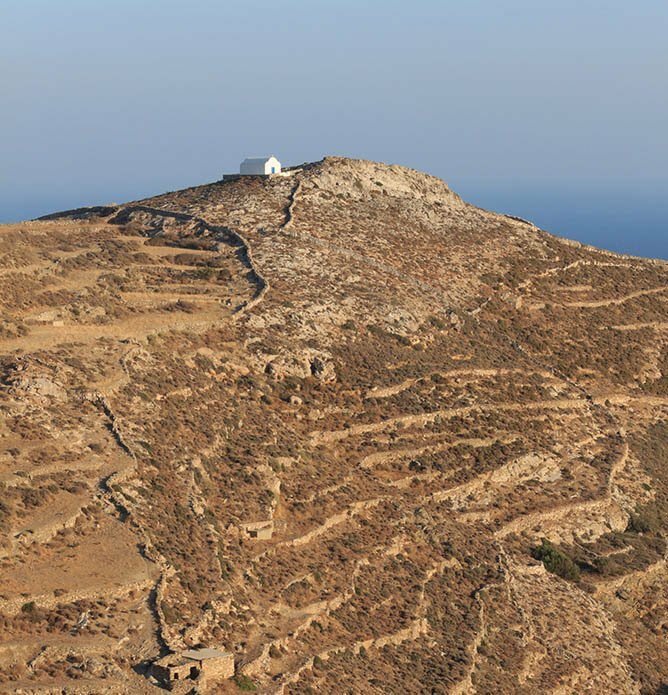 Folegandros is the island of good measure. Ano Meria is renowned for exciting footpaths and here is the beginning of the most hikes that lead to remote beautiful beaches of the island and small churches. Most of them can also be approached by car or scooter. a. Ano Meria Myloi (2 Windmills) – Aspropounta Lighthouse. This is the most beautiful route, starting at the 2 Windmills, Ano Meria and moving in a circle to end up in Aspropounta Lighthouse. The first section of the route begins at Stavros church, right by the Myloi (Windmills) in Ano Meria crosses the Petalakia area and passes above Tzanis gorge. The main route continues along a footpath at the foot of Trahilos hill, and becomes a dirt road that leads to the particularly picturesque Aspropounta Lighthouse (Faros) where the view of the sea is amazing. Walking time: 1 hr Hikers can then follow the footpath downwards, crossing the Skiathitis area and directed towards Livadaki, a sheltered bay with a small pebbly beach. b. Ano Meria (Taxiarhis) – Agios Panteleimonas – Livadaki – Ampeli. From Taxiathis in Ano Meria, the route initially heads west, along the provincial road. After a crossroads with a footpath leading south-west to Livadaki, it heads west towards Agios Panteleimonas along a paved footpath, leading to a location of rare beauty. After Agios Panteleimonas, the footpath is divided into two branches, leading to Ampeli bay. The southern branch, which is initially smooth, later descends steeply towards the picturesque beach. By contrast, the northern branch is steep to start with, but then crosses a pretty gorge, with unusual vegetation by the island’s standards and with traditional cultivation methods (skales). Walking time: 30’ to Ampeli, 40’ to Livadaki. c. Ano Meria – Agios Ioannis Eleimonas – Marmaro – Agios Nikolaos – Aggali. Ioannis Theologos countryside chapel. The footpath descends and crosses the abandoned village of Marmaro, where typical Ano Meria architecture has been preserved intact. As it approaches the coast, the route passes above the picturesque bay of Ai Nikolas – always enchanting – and then descends towards the small beach at Galyfos. Moving along the coast, the footpath finally leads to the small church of Agia Marina, outside Aggali beach. The route can also be followed backwards. Walking time: 1 hour. d. Ano Meria – Agios Andreas – Agios Georgios – Lygaria – ZoodochosPigi. The route starts at the church of Agios Andreas, on the western side of the scattered settlement of Ano Meria. The footpath is mostly paved. Walkers encounter the countryside chapel of Agios Sostis, crossing an area dominated by the typical Ano Meria agricultural landscape, with a panoramic view. This is succeeded by an area with denser vegetation and trees offering cool shadows, and ends up in Agios Georgios bay (also accessible by road directly from Ano Meria). The Ano Meria – Agios Georgios footpath is still used by the area’s farmers and shepherds. Between Agios Georgios bay and Kastello cape, the footpath turns into an agricultural road. Remains of a settlement from the Proto-Cycladic period can be seen in Kastello. From there, the route turns south-west and meets the picturesque small beach of Lygaria. In its last section, the footpath climbs towards the Karkana rise, along a narrow dirt road leading to the church of Zoodochos Pigi (Chrisopigi). With broad views towards the open sea and cape Kyparissi, this hiking route can be completed by returning to Ano Meria village through Merovigli. Walking time Ano Meria – Zoodochos Pigi: 1 hour 15’.